First phase details and photos below second phase section. The second phase of the boardwalk project continues the boardwalk in the wetland from near the Showy Lady's-slippers, to the south end of the wetland path where the terrain begins to rise above the marshy soil. The length of this segment is 327 feet, making the entire boardwalk over 600 feet long. 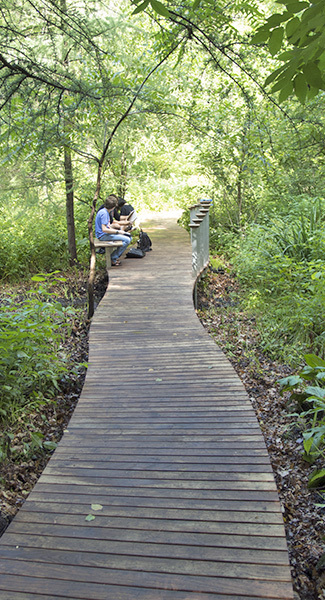 Incorporated into the design of phase II is a diamond shaped gathering area near the Lady's-slippers, which can be used by student groups for wetland study. This section has a curved 20 foot bench. The second segment cost is just over $153,000 bringing the total for both phases to just under $300,000 with half those funds provided by the Minneapolis Park & Recreation Board and half by the Friends. April 2019: Trail source completes installation. Winter 2018/19. Trail Source begins work in early Winter to install the sections. Additional support plates for the first section are also installed to prevent too much sinking. 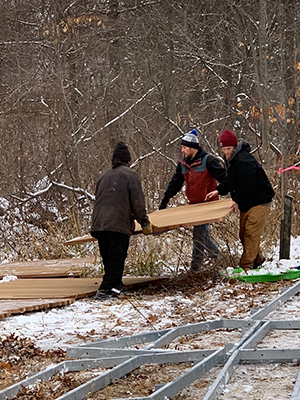 Nov. 29, 2018: The section fabricator, Wickcraft, delivered the completed boardwalk sections at the end of November. 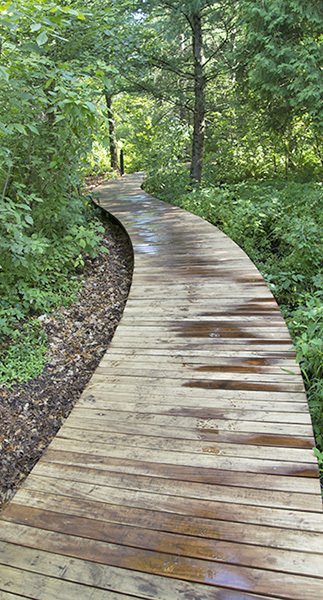 Trailsource was hired by the Park Board to do the installation during the Winter so that the boardwalk would be complete for the opening of the Garden in the Spring of 2019. On Sept. 6 2018: The Park Board approved the Friends funding contract for phase II. The heat-treated ash wood from various Minneapolis Parks had been delivered to the metal fabricator. The Park Board was letting bids for the installation to be done in late Fall/Winter this year. 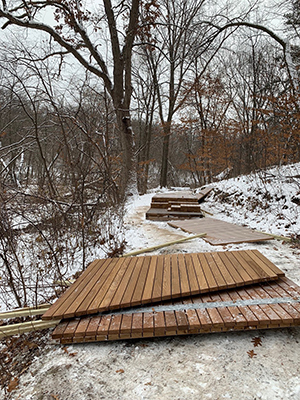 It is late January of 2018 Susan Wilkins was in the Garden to stake out the next sections of the boardwalk in the Garden’s wetland with landscape architect James Robin and Minneapolis Park Board design project manager Tyler Pederson. They charted their way through the wetland with drawings, templates, tape measures and marking flags. The field-proofing gave Tyler and James the information needed to update the design so that the final boardwalk segments are crafted to fit the space in a sensitive and sympathetic manner. Jan. 2017: Fundraising begins for the second phase of the boardwalk. The drawing below illustrates the entire project, showing the sections as they were installed. This illustration details the educational gathering area. Below: James Robin (left) and Tyler Peterson in the wetland measuring for the layout. Photo MPRB. Thanks to all who have donated. The first phase of this new addition to the Garden opened on July 24th, 2015. Awards won - Minnesota Landscape Architects and World Landscape Architecture. 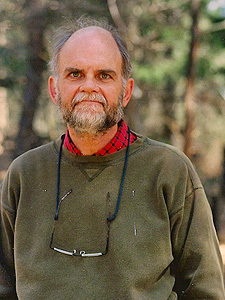 As a tribute to Cary George, the Friends raised funds to restore critical footpath structures in the Garden’s wetland habitat. 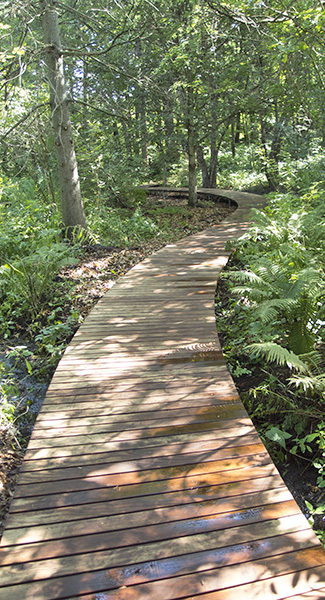 These trail segments, including the wooden bridge next to Mallard Pool and the three wooden walkways south on Lady’s Slipper Lane, are popular among visitors and were very much in need of replacement. 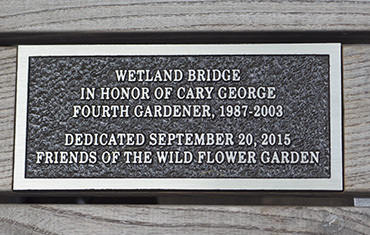 It was true for Cary, as it was for Eloise Butler, that the wetland is the heart of the Garden. We believe that this project in honor of the fourth Gardener to be a testimonial to his service as well as to the Founder and her vision. 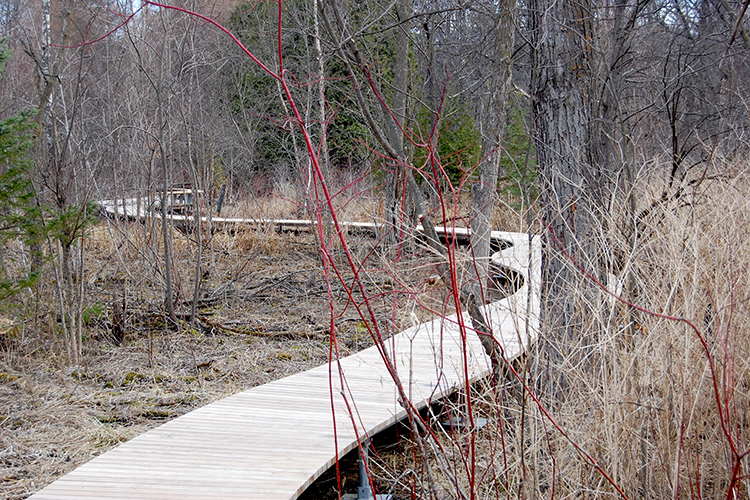 These trail segments have been redesigned and a boardwalk installed for safety and accessibility. Materials and workmanship of high quality will provide decades of use in this beautiful part of the Garden, where Cary worked so diligently to replant and nurture Eloise's Tamarack grove. The initial phase of the project has cost $120,000, with $75,000 donated by The Friends and the remainder by the Minneapolis Park & Recreation Board. We thank all our members who contributed to this project and our major donors - Mark Addicks, People for Parks, the Dorothy Pawlcyn Family Foundation and Judy McKim. 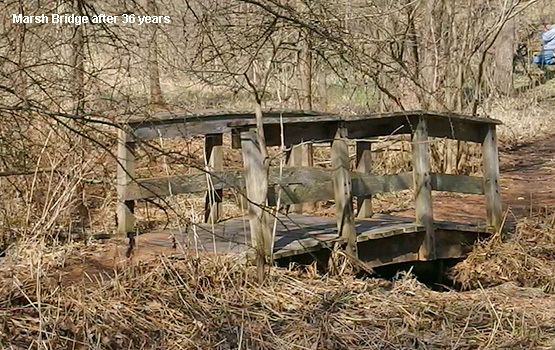 One of the old cedar bridges replaced by the new boardwalk. These new, safer trail structures are humble, modest and practical, too. They are a fitting tribute to the diligence and dedication of the fourth Gardener. 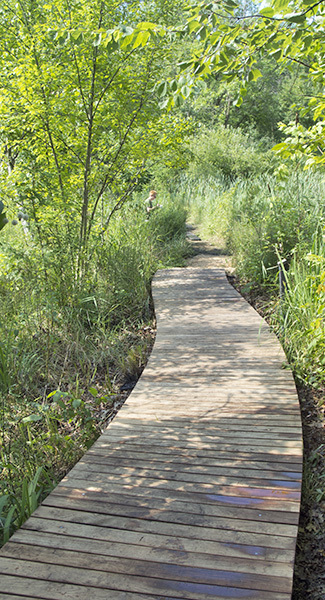 The basic design of the project is a 4 foot wide wooden walking path over the entire area of Lady’s-slipper Lane in the marsh with connecting links to the north end. These areas are frequently wet with spongy surface conditions. 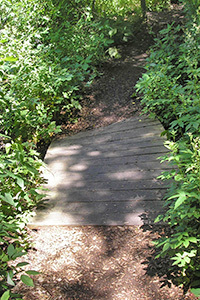 This includes replacing the 3 small cedar bridges that span the water channel in the marsh and replacing the larger bridge on the path that connects Lady’s-slipper lane with the western Geranium Path. A final design for the project was approved by the Friends, The Minneapolis Park and Recreation Board and those in the community who took part in reviewing the plans. Project management is by the Cuningham Group of Minneapolis, James Robin design architect. MPRB Project Director Andrea Weber was in charge of the project. The design incorporates a floating pier system comprised of metal rails that support a wooden deck that is 4 feet wide and mounted just above the ground surface. 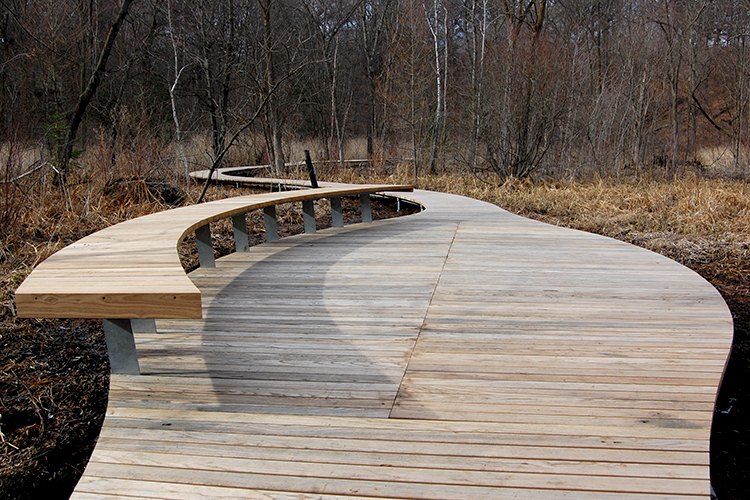 The wood surface is heat-treated ash from local Minneapolis Park & Recreation Board trees. The wood was rough milled in Minneapolis and then kiln dried and thermally modified in Duluth to produce a weather and rot resistant tread. The modular design features 8 foot sections that allow for installation in stages. Each of these sections has a slight curve consistent with the existing curving pathway through the marsh so as to preserve the historical experience, and use the same space, protecting fragile wetland plants. The section that replaced the old bridge was enlarged to accommodate a railing and seating area. Fabrication was done by WICKCRAFT in Madison, WI. 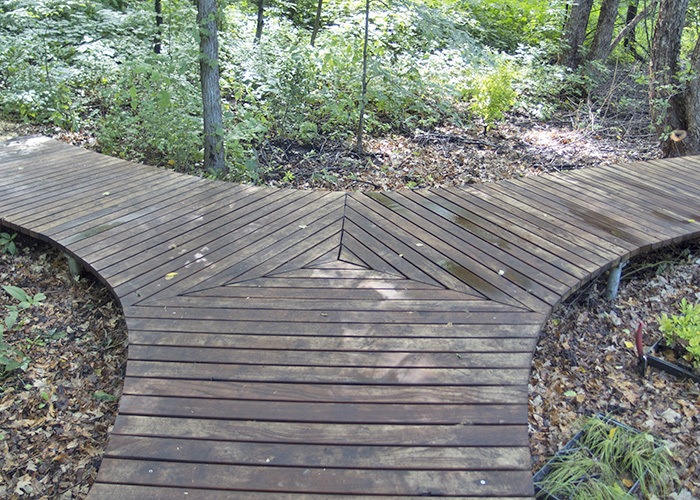 The Conservation Corps Minnesota provided the labor to install. Below: 1st photo - The old main bridge that was installed in the spring of 1990 as it appeared in 2014 (photo G D Bebeau). 2nd photo - the bridge when new in 1990. (photo by Martha Hellander). 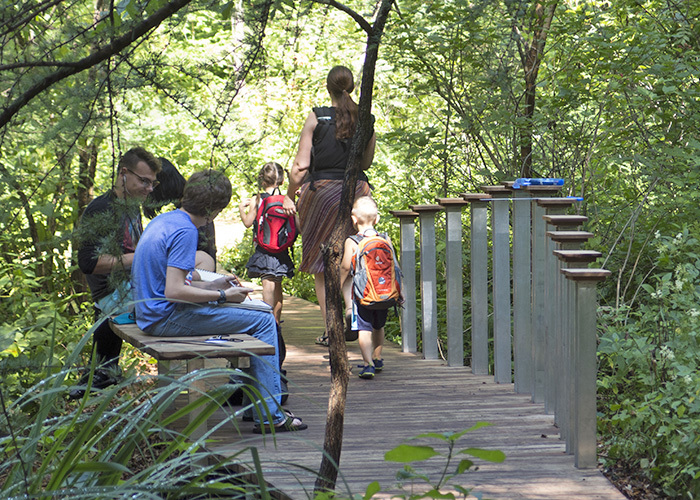 Above: The new bridge over the water channel at Mallard Pool, with sitting area. Above: The two end segments of the new boardwalk. 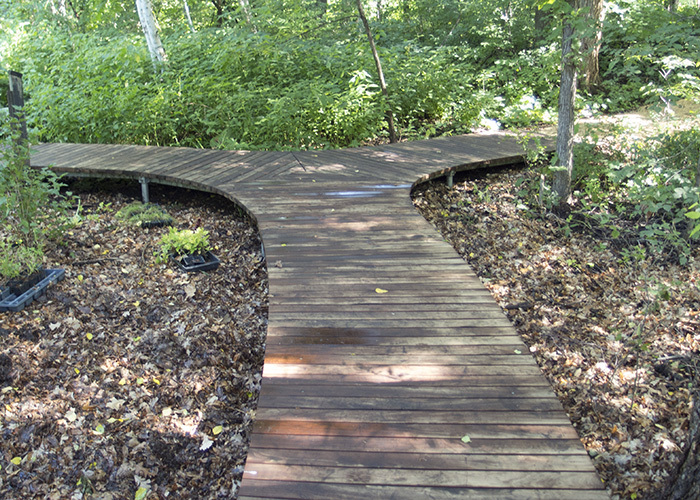 1st photo - Boardwalk extends westerly beyond the bridge to where high ground occurs. 2nd photo - Boardwalk extends into the marsh. Additional segments will be added here as funds are raised. Above and Below: The north end forms a 'Y' with the left portion leading to the new bridge and the right portion leading toward higher ground toward the back gate. Below: MPRB Planning Manager Andrea Weber and Cuningham Group representative David Motzenbecker on the new bridge. 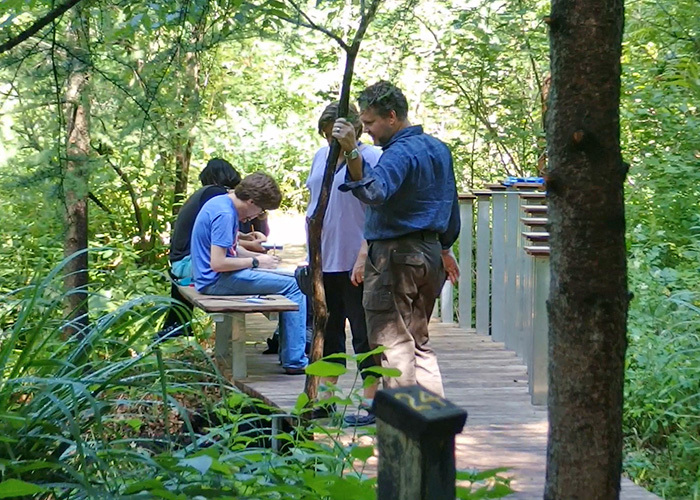 An art drawing class was already using the bridge seating area on the first day. 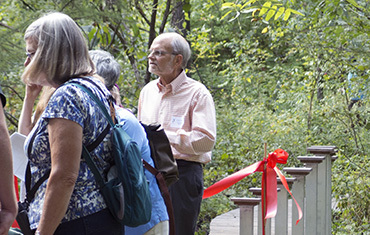 On Sunday Sept. 20, 2015 at 3 PM, Friends, Garden Staff, and invited quests gathered in the Garden to dedicate the new boardwalk and specifically to dedicate the new bridge to Cary George, 4th caretaker of the Garden. Brief comments were made by Friends President Pam Weiner, Garden Curator Susan Wilkins, MPRB Commissioner Anita Tabb and then Cary George. Below: The Dedication Ceremony on the new bridge. The 3 persons on the far right are (l to r) Garden Curator Susan Wilkins, Cary George, Friends President Pam Weiner. 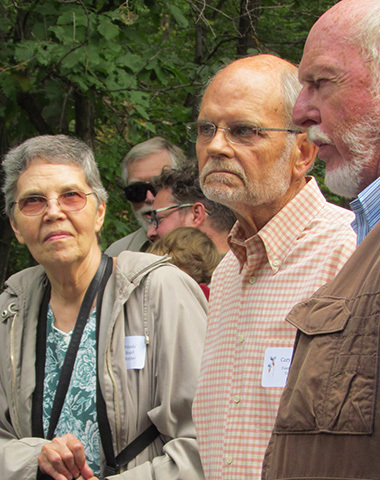 Below: 1st Photo (l to r) Friends Board member and Historian Phoebe Waugh, Cary George, Boardwalk design architect Jim Robin. 2nd photo - at left, Friends member Ann Godfrey talking to Garden Curator Susan Wilkins. Below: 1st photo - Cary George. 2nd photo - Dedication Plaque. 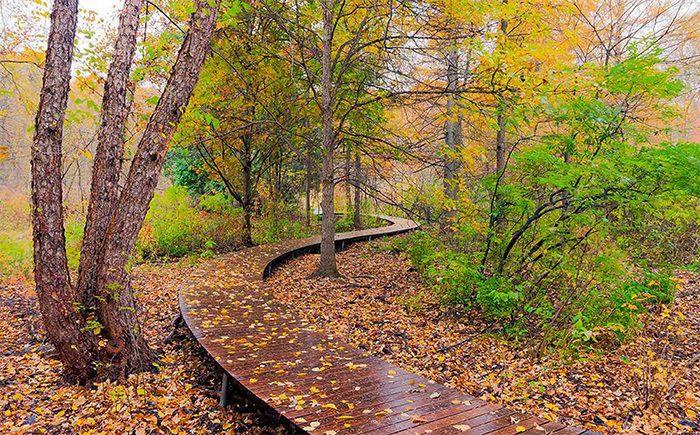 This photo of the newly installed boardwalk is by the Cuningham Group of Minneapolis and is the featured photo in the WLA article. Oct 2011: Several procedural steps need to be completed. 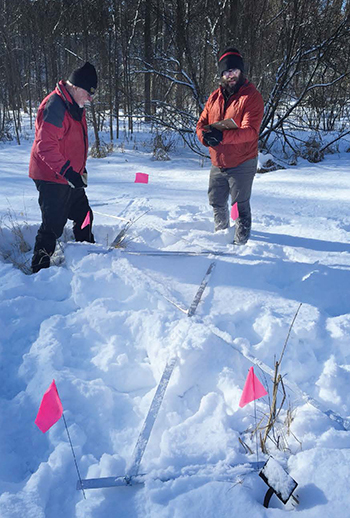 The Minneapolis Park and Recreation Board (MPRB) is first conducting a survey of the wetland area so as not to create a major disturbance during the construction. They must then choose the appropriate design/build firm. It is expected that the material used will be primarily recycled product that is of a newer type than recycled material previously used by MPRB in other projects. Most important, there is a colony of dwarf trout lilies in this area that Garden Curator Susan Wilkins desires to move before construction begins and that move must take place in the spring. 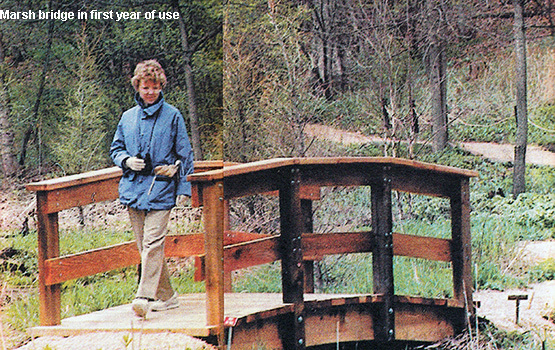 Jan 2012: Rather than replace the small bridges with newer bridges, the Park Board has opted for a boardwalk. The area expected to be served by a boardwalk totals 700 feet in length. It will not all be constructed in phase one as the total cost estimated may reach $100,000 and funding for that amount may not be available in 2012. The Friends expect to contribute $15,000 to this in phase one. May 2012: The required wetland delineation report has been completed. Extensive permitting is not expected to be needed. It was recommended that the existing berm on which the existing pathway be retained and the boardwalk should make use of the same berm. This berm slows down the flow of water through the marsh - which is desirable. Additional funding for this project may be available from a Met Council Capital Improvements grant which the Park Board is in the process of applying for. May 2013: The Park Board staff is releasing a Request for Proposal on the design aspects for the Boardwalk. Proposals are to be submitted back this summer. Sept. 2013: Following the Request for Proposal, MPRB has chosen the Cuningham Group to do the design and engineering work for the project. Design development along with community meetings is scheduled for Sept and Oct. 2013. Permitting and bidding is scheduled for Nov. through Jan. 2014 with first phase construction to be done before spring in 2014. The Friends have deposited $25,000 with the Park Board as our phase one commitment to this project. Oct. 2013: The first planning meeting for boardwalk design was held on Oct. 1st at Park Board headquarters with members of the Cuningham Group design team, Park Board planning staff, the Garden Curator and members of The Friends Planning Committee in attendance. 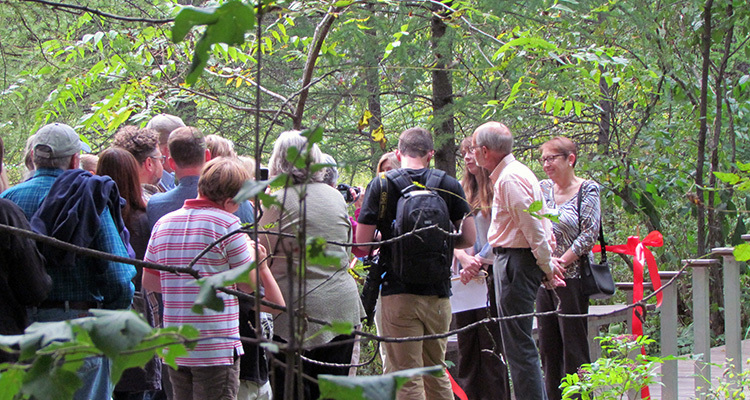 Members of the Planning Committee met at the Garden on Oct. 29th with Curator Susan Wilkins to review the proposed design of the boardwalk, width, height, and ideas for the Bridge Area. Nov. 2013: An Open house and public comment meeting occurred on Nov. 21st for public review of the design thus far. The meeting was at the Wirth Park Pavilion, 3275 Glenwood Ave. No., Golden Valley, MN 6:30 to 7:30 PM. Dec. 2013: People for Parks has setup a $12,500 matching grant for the Cary George Wetland Project - to be reached by Aug. 2014. Feb. 2014: A final planning meeting was held on Feb. 13th and bidding documents are being prepared. April 2014: Video created about the project - link at top of page. Aug. 2014: The MPRB has the project out for bids. WE HAVE MET the dollar amount for the People for Parks matching grant. That means we have another $25,000 plus for the project. Sept 2014: Contractors are so busy that we only received one bid on the project and it was too far above Cuningham Group's estimate to be accepted. The project will be re-bid in November. Feb. 2015: Contractor bids were still much to high. MPRB is going to contract directly with metal manufacturer and with Conservation Corp of Minnesota for installation in mid-summer 2015. Recycled ash wood for the treads is ready to go. Looks like this is the year it will get done. March 2015: Acceptable bids secured for framework and installation. Expected installation in July or August, dedication in September. July 2015: The boardwalk and bridge were installed between July 10 and 23rd. Open to the public on July 24. 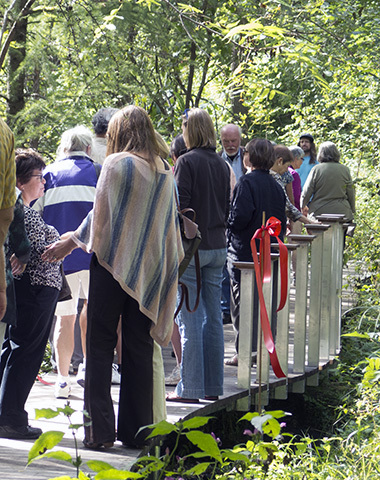 Sept 2015: Dedication was on Sunday, Sept. 20th, 3 to 5PM with Cary George attending.